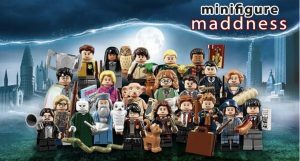 Enjoy magic and adventure with the LEGO® Minifigures Harry Potter™ and Fantastic Beasts™ collection, featuring exclusive Limited Edition minifigures and new-for-August-2018 costumes and accessories, including Harry’s Invisibility Cloak, a Golden Snitch, Voldemort’s snake Nagini and Newt’s Niffler and case! Recreate and reimagine your favorite Fantastic Beasts scenes with Newt Scamander™, Jacob Kowalski, Tina Goldstein™, Queenie Goldstein™ and Credence Barebone™. Then journey to the world of Harry Potter with Luna Lovegood™, Neville Longbottom™, Cho Chang, Dean Thomas, Lord Voldemort™, Dobby™, Cedric Diggory, Mad-Eye Moody, Professor Flitwick, Professor Trelawney, Albus Dumbledore™, Harry Potter in School Robes, Ron Weasley™ in School Robes, Hermione Granger™ in School Robes, Draco Malfoy™, Harry Potter in Pajamas and Percival Graves! Each finely crafted minifigure comes with one or more accessory elements, plus a collector’s leaflet and a unique display baseplate. Complete boxes of 60 available now! , Best Price Guarantee only at Minifigure Maddness! . ← LEGO minifigures series 18, in stock now!